KeyCreator 2014 V12.0 Now Shipping! | Technology Education Concepts, Inc.
KeyCreator 2014 V12.0 Now Shipping! The True Engineering Tool with the Simplicity of Direct Modeling! 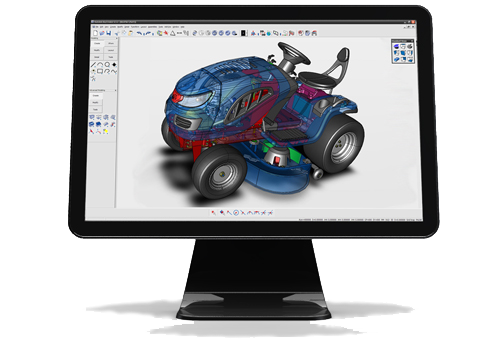 As the most complete Direct Modeler available, KeyCreator Direct CAD is the CAD software continues to be the top choice not only for students and educators but also for manufacturers, tool, die and mold makers, job shops and product designers. Other big news: The new KeyCreator Student Version is available free of charge to approved, eligible students. Students simply need to request a KeyCreator Student Version license here. The KeyCreator Student Version contains the same professional-level precision design tools as the commercial version of KeyCreator, including Adobe PDF output capabilities and 3D STL for rapid prototyping. File exporting capabilities are limited. The KeyCreator Student Version license is renewable annually. Students also have unlimited access to hundreds of online courses and learning aids available through Kubotek University. A “What’s New” document from KobotekUSA is available (download) that highlights several product updates. You can also watch a short Direct Modeling video to see how easy creating a model can be in KeyCreator 2014 (watch). We are pleased to announce that there is no increase in pricing for the new version of KeyCreator to academic users for new or upgrade seats! • Free Technical Support! • No Annual Fees! • Always Upgradeable! Upgrade your existing seats or add new seats today!